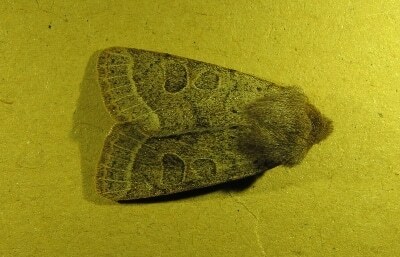 Common Quaker Orthosia cerasi, found in a bedroom at my house Nedd on 27th March 2015. This spring-flying noctuid moth occurs in a range of shades of brown, with a conspicuous pale-edged oval and kidney-mark on the fore-wing. The adults feed on sallow catkins, which are just beginning to open, and the caterpillars on the leaves of oak, sallow and hazel in May and June. Although widespread further south, it is apparently scarce in the north of Scotland.